What originally attracted you to work at IAG? What really attracted me to IAG was their approach. I asked them “How do you execute a project?” Their answer to me was, “You do the project using your best judgement. 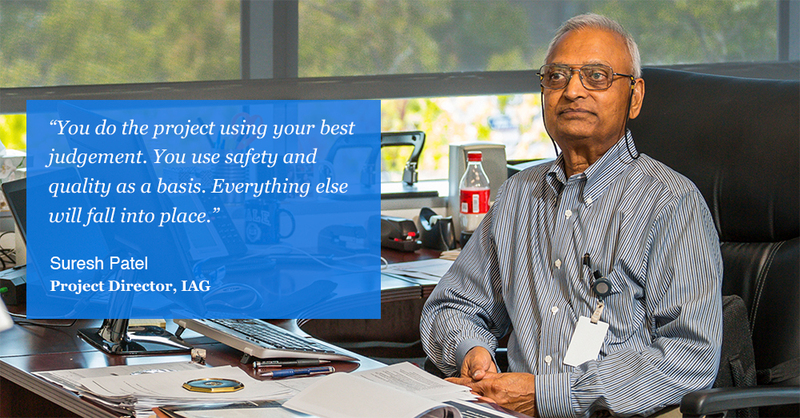 You use safety and quality as a basis. Everything else will fall into place.” At the company I came from there was tons and tons of paperwork, procedures, standards, methods, execution requirements to follow through with. IAG had very streamlined requirements. And they followed through on them. That ensures the safety and quality of the project is maintained, rather than following blindly something that a piece of paper says. You must visualize how the project and scope of work will be at the end of the project, rather than looking for it as it happens. What are the key tactics that make an FCC project successful? There’re a few things that you have to really look at. When you develop the scope of work you really need to make sure the intent of the licenser is maintained throughout the job. So, you identify everything that is required to meet the intent of the process guarantee. And because the client wants to work with the scope too, you develop every little detail to ensure nothing is missing. You must visualize how the project and scope of work will be at the end of the project, rather than looking for it as it happens. This will allow you to prepare the scope and develop the schedule to ensure it is executed without delays. And you also work with the team. It’s a team effort. Client input, licensor input, engineering input and your own input to make sure that everything is included and agreed upon. You have to concur with the constructor to ensure that they understand that what’s on the paper needs to be installed. In the end that’s what’s important. Just because you can put something nicely on a drawing doesn’t mean that it’s going to end up like that. You have to make sure they understand what is required on it. How do you create consensus between all the different people involved in an FCC project? First of all, you explain to the contractor what is required to interpret the drawings, the spec, the scope of work and what the schedule requirement are. Same thing with the client’s team: operations, maintenance, TAR team and so on. Early client input from their maintenance and TAR team is extremely essential. It can’t just come at the end of the job. Because they are the people that have to operate it. When we are finished it’s in their hands. You have to make sure you understand what their needs are. Do you ever run into misaligned priorities between those different groups? Well yeah of course. All people have their own opinion. But in the end, everybody has the same purpose. They want to do the job right. So, you must be able to convince others that this is the right way to do it. And you have to work with people to make sure they understand intent. That’s where teamwork comes in. You don’t work against anybody, you work with them. Most people think that information is power...That doesn’t work in an FCC project. You make sure all the information is out there for the guy who’s going to do the work. You hold nothing back on them. These projects have people working inside the equipment. And these are all confined spaces, people working on top of each other. You have to identify every little thing necessary for installations because the constructor might not know what the priorities are and what needs to be done when. So, we tell him every little thing, so he can prioritize what needs to be done when, safely. Most people think that information is power: “If I know something that you don’t, its power for me.” That doesn’t work in an FCC project. You make sure all the information is out there for the guy who’s going to do the work. You hold nothing back on them. Anybody can do the job if they’re given all the time in the world. But we can provide the client with tighter schedules and follow through with it because of our know-how and experience. IAG has a reputation for delivering projects on time and budget. How have you been able to achieve that so consistently over so many years? We have done hundreds of, not only projects, but proposals and estimates, all over the world. To do these projects well, you have to develop a fairly good scope in your own mind at the beginning of the project. A lot of people just look at what their equipment is and try to come up with estimates. We looked at our own experience doing many things similar to it and can come up with scope and estimates long before anybody else. Then we can provide prices before anybody can even think about it because we can work with the licensor concurrently while we customize work scope development to provide a very accurate estimate and realistic schedule for clients. The difficulty with FCC’s is that they’re fairly complex and have a difficult schedule. Anybody can do the job if they’re given all the time in the world. But we can provide the client with tighter schedules and follow through with it because of our know-how and experience working with licensors, clients, engineers, vendors and constructors. What do you consider your greatest achievement at IAG? I’ve done quite a large number of projects and I can say that I’ve never had a technical, complaint, or flaw come back from any client. They have all been basically on time and met all the requirements of the licensers’ intent, schedule, and cost. What challenges and opportunities does the industry face right now? Many operating companies hire strictly based on a low cost from bidders. And that may or may not reflect the true work scope and schedule for the project. And in the end, they always overrun project cost and schedule. But it’s too late by then. So how do you convince people to do the right job in the right way from the beginning? Also, a large number of operating companies have a tremendous amount of turnover. So, people in those jobs have the pressure of keeping the cost down. And when the cost overruns, it’s not their problem, it’s the next guys. It’s a difficult task. This work is always a team project. When you are isolated, the job is not going to get done and not going to get done right. The best advice I got was when I joined IAG: There is no substitute for good judgement. Engineering is always a judgment based on safety and quality of project work scope. The other thing I’ll say is that this work is always a team project. When you are isolated, the job is not going to get done and not going to get done right. Team includes everybody. Not just IAG. The team is the Client, Licensor, IAG, Engineering, Vendors and Constructors. And I would say that it’s important that your management supports you in what you do. I’ve been fortunate that they’ve been very very supportive of me for 20 years. It makes all the difference of doing the job right.